PanARMENIAN.Net - With a final approval on Friday, August 31 by the California State Assembly, the Turkish Divestment bill (AB-1597) spearheaded by Assemblyman Adrin Nazarian– and championed by the Armenian National Committee of America Western Region and Armenian Youth Federation Western U.S.– was sent to Governor Jerry Brown for his signature, ANCA-WR reports. On Thursday, with a vote of 36-0 and four abstentions, the California State Senate adopted the bill, which calls for the divestment of California public funds from Turkish government controlled financial instruments, ensuring taxpayer funds are no longer used in this manner to aid and abet Turkey’s century long obstruction of justice for the Armenian Genocide. In recent months with the assistance of Senators Anthony Portantino and Scott Wilk, AB 1597 has continued to gain momentum by passing in Senate Appropriations a few weeks back and the Senate Public Employment & Retirement Committee and Senate Judiciary Committee in June. Prior to the passage in these various committees, the ANCA-WR worked diligently with the AYF to present the measure as well as the Divest Turkey initiative to the University of California Board of Regents during the session of the Investments Subcommittee. The Divest Turkey measure was placed on the agenda of this Investments Subcommittee following a hearing in February of the Senate Select Committee on California, Armenia and Artsakh Mutual Trade, Art and Cultural Exchange chaired by Senator Portantino where testimonies were provided by members of the AYF and Jagdeep Bachher, Chief Investment Officer, Vice President of Investments at the University of California. “We want to thank Assemblymember Adrin Nazarian for introducing the Divest Turkey bill and seeing it through and Senators Anthony Portantino and Scott Wilk for helping ensure its passage through the Senate. After the concept was conceived and developed by the Armenian Youth Federation and the ASAs to secure unanimous support of all nine UC campuses, we were gratified to work closely with the AYF, the local ASAs, and our friends in the State Legislature toward unanimous votes in both houses and are grateful for the collaboration and unified efforts of all who played a role in its passage,” stated Nora Hovsepian, ANCA-WR Chair. AB 1597 prohibits the boards of the California Public Retirement System (CalPERS) and California State Teachers’ Retirement System (CalSTRS) from making additional or new investments, or renewing existing investments issued, owned, controlled, or managed by the government of Turkey, when the United States government sanctions the government of Turkey for not recognizing the Armenian Genocide. 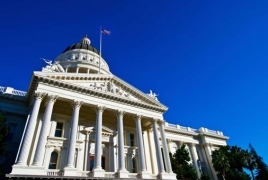 This bill also requires the boards of CalPERS and CalSTRS to submit reports to the Legislature and the Governor, within a year of when the federal government issues sanctions against Turkey. The report will detail a list of investments that they have already liquidated and a list of investments that potentially can be liquidated. California has a long history of divesting from countries that violate human rights, South Africa (apartheid policy), Sudan (Darfur genocide), and Iran (international terrorism, human rights violations.) A divestment from Turkish bonds over Turkey’s denial of the Armenian Genocide, the continued funding of a campaign of genocide denial, and the recent erosion of democratic principles would send a clear message that California, the 5th largest economy in the world, demands justice and recognition for 1.5 million Armenians killed.